Ohio's Miami Valley area offers both beautiful open road/back road cycling, as well as a wonderful system of recreational trails to its residents and visitors. Over 250 miles of delightful, invigorating trails stretch across five counties, crossing a variety of terrains. The Little Miami/Ohio-to-Erie Bike Trail system is primarily a fully-paved, former railroad bed. It connects at the centrally-located Xenia Bike Station hub to the the Ohio-to-Erie Trail and a number of other interconnected routes. 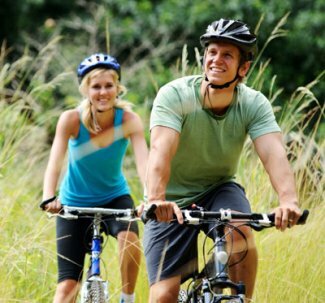 CLICK HERE for an overview of our regional bike trails and other cycling resources! A great ride is a good reason to stay at Hearthstone Inn & Suites here in Greene County, Ohio! Over a million people a year find it in Greene County! If you like bike paths, Greene County is the gateway to over 140 miles of paved rails-to-trails. Prefer the open road? There are over 600 miles of relaxing country roads, try one of our suggested rides. Mountain biking? We have over 14 miles of dedicated trails. You'll discover espresso bars, bike rentals (right here at Hearthstone too!) and restaurants right on the bike paths. Trail users ride past museums and monuments, picnic areas and restaurants, and acres of gently-rolling terrain. The trails wind through small towns rich with history and charm including Cedarville, Yellow Springs, and Loveland. Hearthstone Inn & Suites is located directly on Trail #1 (The Ohio-To-Erie Trail/Prarie Grass Trail.) We are 7.78 miles from the Little Miami Bike Trail (Trail #3) with the connection hub centralized at Xenia Station. From the Xenia Station hub, you can bike on some of the most amazing off-road cycling trail routes in the United States! We are in a small, family-friendly village. You may confidently lock your bike securely in our side PATIO BIKE RACK, to a banister railing on our covered wrap-around porch, or store your bike in your room. Or you may leave it/them secured in or on your vehicle. By the way, our delightful Guest Patio provides cyclists/groups with a comfortable area to sit, talk, play cards, or enjoy a beverage under Edison light illumination. Bike rentals are available on site! We have single trail bikes and delightful 2-person tandems available for hourly or daily rental. HELMETS are recommended and available at no extra charge. All regional trails are fully paved and virtually flat with some occasional slight grades. Mostly off-road with intermittent road crossings.